For those that have graduated college in the past five-ten years, chances are you’re still paying off student loans. Six years after college, and I am still faced with approximately $20,000 in loans, even though I’ve already paid down more than $10,000. I often wonder how people my age, the twenty-something, early thirty-something crowd, manage to pay off debt and still become financially stable–all at the same time. How are you supposed to be pay off debt, buy a car, save money for a down payment, prepare for a family, contribute to retirement and manage to still have fun in your twenties? Perhaps for women it may be different. I definitely feel like I am racing my biological clock to get everything in order before time runs out, since 35 is the age that women are considered high-risk pregnancies. At 28, I feel like I’m definitely not where I envisioned my life. In fact, according to my “five-year plan” when I graduated college, I wouldn’t even be married by now! I know a lot of people often feel like there life doesn’t look like what they envisioned, and yet it still manages to be exactly what they needed it to be. 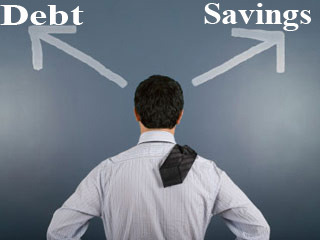 I definitely feel that–but how do I save for my goals while I’m still paying down debt? Pay off credit card debt first. When it came to creating our financial master plan–as in figuring out our financial goals for retirement, babies, buying a house, etc–we knew that our debt was going to keep us from reaching those goals unless we acted fast. So we took our debt–credit cards, car loans, and student loans–and put them in order of how we were going to pay them off. We started with the credit card debt, then moved on to the car loan, and now work on the student loans. We also work very hard to keep our consumer spending in check so we don’t get back into credit card debt. Living within our means has helped with these goals. Always contribute your company match into your 401K. Anytime I started a new job, I contributed up to the company match into my 401K. Normally, a match is 3%, so if I contributed 3%, my company would contribute 3%, and I would have a total of 6% contributed to my 401K annually. I always, always, always contribute up to the company match no matter how much debt I have because that is FREE money. It’s like a work bonus. You can’t pass that up. Save, Save, Save. Our savings started out small. Miniscule, really. And then we pushed ourselves to live well below our means. Instead of leaving “extra” money lying around in our checking account, we’d move it to savings. That way, if we really needed more money before the next paycheck, we could move just what we needed from savings to checking. But we knew that if we just left it in our checking, it would get spent no matter what. We save much more aggressively nowadays, and we also have several savings accounts to allocate money toward separate goals, such as Christmas, School, Car Insurance, Future Car purchase, etc. Let go of your plan. This was by far the hardest. I always wanted to be a home owner before I had kids. I’m starting to realize that most likely won’t happen and I’m okay with it. We live in a two-bedroom townhome, so it’s not like we’ll be crunched for space. And continuing to rent will allow us to boost our savings even more until we can afford our perfect dream home.